One of the biggest concerns with using a smartphone is that the battery life doesn’t last long enough. Users are spending more time watching videos, streaming music and playing games on their smartphones than ever before, resulting in faster battery consumption. To help ease consumer battery anxiety (the feeling one gets when your phone is about to die), more charging opportunities with a seamless cordless experience is desired. Lucky for consumers, Apple® embraced Qi® wireless charging with its release of the iPhone 8 and iPhone X. The adoption of Qi wireless power in these new iPhones represents a major milestone for the broad usage of wireless charging technology, bringing an enhanced experience to iPhone® users. We expect that the release of the iPhone 8 and iPhone X will drive further infrastructure build out for Qi charging stations in more places – homes, cars, offices, restaurants, airports and hotels – offering a seamless charging experience and much less charging anxiety. 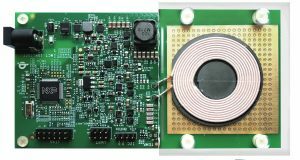 As the supplier of the most comprehensive portfolio of Qi-certified wireless power transmitter and receiver solutions in the industry, NXP Semiconductors is excited about the expanding number of users of wireless power technology. Smartphone owners will have more opportunities for charging, and now at faster rates. Aligned to the latest trends in smartphone user experience, NXP is the first to offer the WCT-15W1TXFF, a new fixed-frequency single-coil design, optimized for the latest smartphone charging stations. Based on the Qi standard, transmitters everywhere are able to power all types of smart devices and mobile phones, regardless of brand. Soon, the daily life of the average smart phone user will be greatly enhanced by an infrastructure of transmitters that will enable charging everywhere. NXP develops system-level wireless power solutions built on Qi-certified transmitters and receivers. These solutions contain NXP application software, libraries, controllers, NFC readers and power devices. NXP offers convenience, freedom and safety through completely cordless experiences, with no compromise in performance and reliability in a wide range of applications from consumer devices to portable computing and in-vehicle charging. Explore all of NXP’s wireless power solutions at www.nxp.com/wirelesspower. NXP and the NXP logo are trademarks of NXP B.V. All other product or service names are the property of their respective owners. Apple and iPhone are trademarks of Apple Inc., registered in the U.S. and other countries. © 2017 NXP B.V.